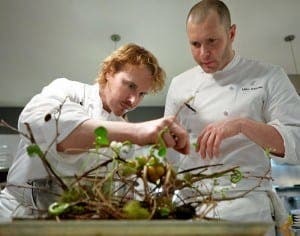 EXPERIMENTAL American chef Grant Achatz has moved restaurant across the pond to kick off a tasty 2016. His three-Michelin-starred restaurant, Alinea, and its entire staff will swap Chicago for Madrid’s NH Hotel Eurobuilding until February 6. The ‘degustacion’ menu of 13 intricate courses, including dry ice, black truffle and ‘parsley graffiti’, starts at a cool €275 per head. The chef who previously interned at elBulli in Catalunya is passionate about Spanish cuisine and ‘loves the long-standing food traditions and strong regionalism in Spain that the USA doesn’t have’.